As promised, here is another data point from the Adipose Stem Cell Clinical Trial Summary spreadsheet. I started this project many weeks ago by gathering information from ClinicalTrials.gov database. Why is knowing whether the Clinical Trial used autologous or allogeneic cells important? Adult Stem Cells can be derived from a wide variety of tissues including bone marrow, umbilical cord blood, peripheral cord blood, dental pulp, and adipose tissue. Clinical Trials are currently recruiting for a wide range of disease indications. My database includes all registered clinical trials since 2004 which used adipose stem cells as the stem cell source. This week I will focus on whether each of the 54 existing adipose stem cell trials used autologous or allogeneic stem cells. This analysis therefore includes all adipose clinical trials, regardless of recruitment status. 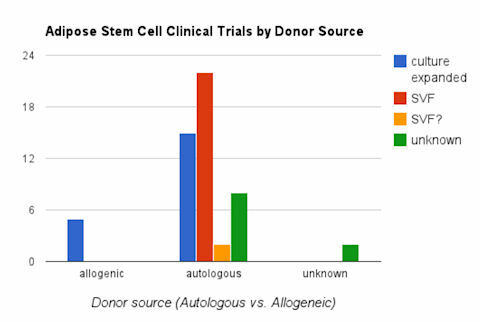 Autologous Stem Cells: YOU are the donor source. The stem cells are derived from your own tissue and then reinjected back into you. Allogeneic Stem Cells: The stem cells come from another human being. They are not your own stem cells. They are derived from one person and reinjected back into a different person. The term has an alternate spelling of allogenic. WHY SHOULD I CARE IF THE CLINICAL TRIALS USED AUTOLOGOUS OR ALLOGENEIC ADIPOSE STEM CELLS? So, why is knowing whether the clinical trial used autologous or allogeneic adipose stem cells important? It is important because each category represents a different sector of the health care industry. Thus, it gives a hint as to whether Pharma, Device Makers, or Personalized Medicine are leading in the new era of Regenerative Medicine. Autologous Cell Therapy: This is personalized medicine which comes more closely under the jurisdiction of Practice of Medicine. Many physicians believe that minimally manipulated autologous cells reinjected in the same operative session should not be subject to the FDA guidelines for ‘drugs’, and instead should be regulated by State Medical Boards like other medical procedures. The FDA has still not made an official ruling in the Federal Register. Autologous therapy is a one-to-one delivery of cells. It does not represent the typical ‘drug’ mass produced product that is produced by Big Pharma. However, Medical Device Makers such as Cytori and Tissue Genesis will deliver devices to assist the physician with delivery of the cells according to Good Tissue Practices (GTP) and Good Manufacturing Practices (GMP) standards. Allogeneic Cell Therapy: This type of stem cell therapy is under the jurisdiction of the FDA because the donor source is another human being. These products are considered to be like ‘drugs’ since they are manufactured by Big Pharma in batches and ‘distributed to many’. WHAT DOES THE CHART OF AUTOLOGOUS VS. ALLOGENIC SAY ABOUT THE CLINICAL TRIALS? The chart above shows that more Adipose Stem Cell Trials are being conducted with autologous stem cells compared to allogeneic cells. Autologous cells represent personalized medicine. The different colored bars under the ‘autologous’ category show whether the clinical trial used culture expanded cells, SVF (stromal vascular fraction), SVF ? (could not determine) , or unknown cell processing. In summary the colored bars show that both freshly isolated SVF (stromal vascular fraction) AND culture expanded (in a lab) are being used in clinical trials. Freshly isolated SVF can be extracted and reinjected in the same operative session. Cultured cells are processed in a lab for days or weeks and require another operative session for cell therapy treatment. Adipose stem cells are cultured when treatment requires higher dosing and/or more homogeneous phenotype of stem cells. Next week We will be posting more analysis on the Sponsors with the most number of clinical trials. Stay tuned!